Now, researchers from the London Centre for Nanotechnology at UCL and the University of British Columbia have shown that the electrons in CuPc can remain in 'superposition' – an intrinsically quantum effect where the electron exists in two states at once - for surprisingly long times, showing this simple dye molecule has potential as a medium for quantum technologies. The development of quantum computing requires precise control of tiny individual "qubits", the quantum analogs of the classical binary bits, '0' and '1', which underpin all of our computation and communications technologies today. What distinguishes the "qubits" from classical bits is their ability to exist in superposition states. The decay time of such superpositions tells us how useful a candidate qubit could be in quantum technologies. If this time is long, quantum data storage, manipulation and transmission become possible. Lead author Marc Warner from the London Centre for Nanotechnology, said: "In theory, a quantum computer can easily solve problems that a normal, classical, computer would not be able to answer in the lifetime of the universe. We just don't know how to build one yet. "Our research shows that a common blue dye has more potential for quantum computing than many of the more exotic molecules that have been considered previously." CuPc possesses many other attributes that could exploit the spin of electrons, rather than their charge, to store and process information which are highly desirable in a more conventional quantum technology. For example, the pigment strongly absorbs visible light and is easy to modify chemically and physically, so its magnetic and electrical properties can be controlled. 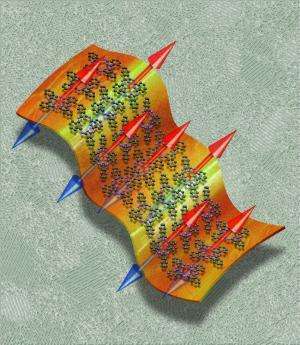 Dr Warner added: "The properties of copper phthalocyanine make it of interest for the emerging field of quantum engineering, which seeks to exploit the quantum properties of matter to perform tasks like information processing or sensing more effectively than has ever been possible." More information: 'Potential for Spin-Based Information Processing in Metallo-Organic Semiconductors', DOI: 10.1038/nature12597 , is published online today in Nature. How long? a couple of microseconds or a couple of years? There is already a computer called Deep Blue and it arm wrestled Gary Kasparov to the ground. Deep Blue is ancient, current fastest silicon chip based computer on the planet is 3000000 times faster. And this type of design is about to reach it's limitations. I'm not putting my bet on quantum computers in the next 7~8 years, but it's good people are already working on it. The duration is (not suprisingly) temperature dependent. You can get the exact values for various temperatures by following the bouncing baby link at the bottom of the article to the abstract of the paper. I hope you are right Peerd. It is my intuition that one of the necessary but not sufficient factors of our survival will be the manufacture of realistic artificial intelligence. Sir Roger Penrose explored the idea that our wet-ware uses quantum computing, which makes sense. Evolution is not sniffy, if QC gives some organism a huge edge it will be utilised. Consider Portia, the Jumping spider. She has been shown to plan her attack on other larger spiders. And her brain is microscopic. The mechanistic, digital computer analogy for our own brain fails scrutiny. One thing I can be sure of though, the computers are going to be a lot faster. For now we just need to make the jump from silicon to the next grand design, which I doubt it will already be quantum.